Ferrer, G.; Garrell, A.; Sanfeliu, A.
Robots accompanying humans is one of the core capacities every service robot deployed in urban settings should have. We present a novel robot companion approach based on the so-called Social Force Model (SFM). A new model of robot-person interaction is obtained using the SFM which is suited for our robots Tibi and Dabo. Additionally, we propose an interactive scheme for robot’s human-awareness navigation using the SFM and prediction information. Moreover, we present a new metric to evaluate the robot companion performance based on vital spaces and comfortableness criteria. Also, a multimodal human feedback is proposed to enhance the behavior of the system. The validation of the model is accomplished throughout an extensive set of simulations and real-life experiments. Ferrer, G.; Garrell, A.; Sanfeliu, A. 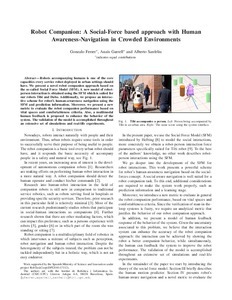 Robot companion: a social-force based approach with human awareness-navigation in crowded environments. A: IEEE/RSJ International Conference on Intelligent Robots and Systems. "IROS 2013: New Horizon Conference Digest: 2013 IEEE/RSJ International Conference on Intelligent Robots and Systems: Tokyo, Big Sight, Tokyo, Japan, November 3-8, 2013". Tokyo: Institute of Electrical and Electronics Engineers (IEEE), 2013, p. 1688-1694.